Obviously the big stars of this track are Richard Smallwood’s beautiful song and Whitney Houston’s virtuosic performance. However, when I had to learn this arrangement, the glowing harmony and counterpoint of the piano accompaniment caught my ear. I loved the fact that I couldn’t say, “that’s a jazz player,” or “that’s a church player,” or “that’s a classical player,” because it has all of that masterfully in equal measure. I’m still not 100% sure who the pianist is, but by far the most likely candidate is Mervyn Warren. He arranged and produced the track with Whitney and also has the chops in all of those styles to pull it off. I’m going to write the rest of this assuming that it’s him, but if anybody has any knowledge to the contrary, please let me know so I can credit it properly! Now that I’ve transcribed it, I’ve learned, as I often do, that the magic is not in fancy notes, but in how they’re played (and recorded). Firstly, the piano sound is impeccable. Getting a tone like that is a collaborative effort between the pianist, the tracking engineers (in this case Frank Wolf, Joseph Mcgee, and Michael White), the mix engineer (in this case, Frank Reitzas), the piano tuner, and the manufacturer of the instrument. As far as performance goes, every note is perfectly balanced dynamically, which made it easy to transcribe. Every note speaks and none stick out too much. With all of that said, there are also some fancy notes in there! 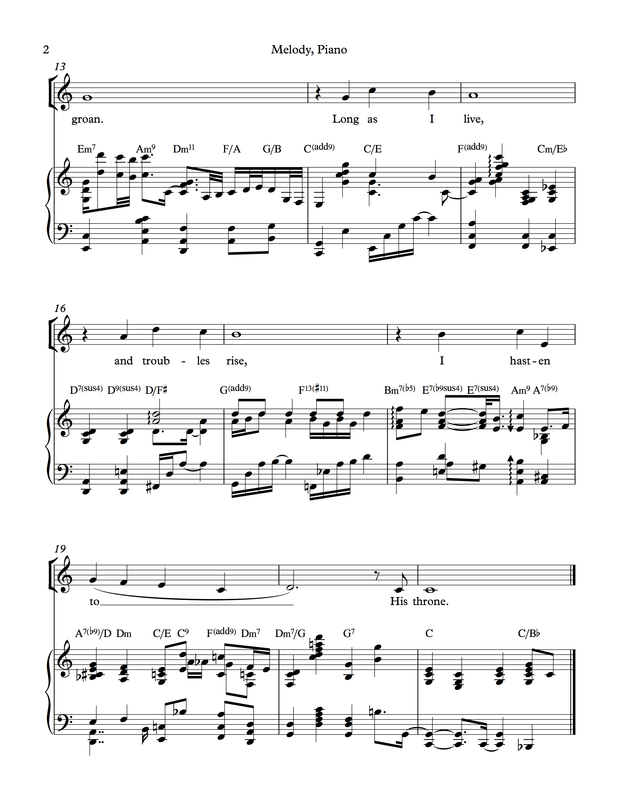 This excerpt is a masterclass in harmonic rhythm, which, in a song like this, basically means “how fast the chords change and when.” One of the moments that gets me is at 0:46, or beat 4 of bar 13. You’d expect this to be a quarter note G (V) chord of some kind. Instead, you get a quick 1st inversion F-G (IV-V) in eighth notes. The other really cool harmonic rhythm moment is 1:10, or bar 19. The harmonic rhythm you’d expect is 2 beats of D minor (ii), and a quarter note walkup on beats 3 and 4. Well, that basic structure is there, but you have a quick C9 (V7/IV) on the and of 3, followed immediately by an unexpected Dm (ii) on the and of 4. Fairly common church chords, but because you’re not expecting them to suddenly move so fast, it’s a thrilling little moment. 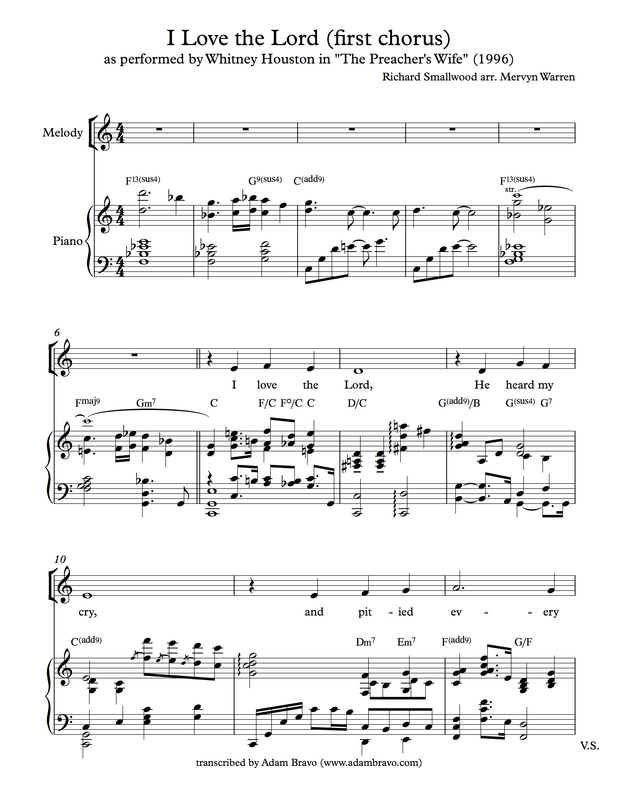 Other little things I love: the chorale-style contrary motion counterpoint behind Whitney’s entrance in bar 7. It’s almost organ-like, with the descending C-B-Bb-A line doubled at the octave in the middle of the texture. Each moment has a chord that makes sense, but the chords clearly arose from the counterpoint. Mervyn is one of the great vocal arrangers, so a mastery of counterpoint isn’t unexpected here. I also really like how he delays the E7 in bar 18; it makes the F13#11 in bar 17 feel really juicy because it doesn’t go where you’d expect (normally it’s a tritone sub going to E7). And finally, I love the relative simplicity of the voicing at 1:17, or beat 2 of bar 20. It’s very church and really centers us before we launch into the next chorus. I’d be really curious to know how much of this was worked out beforehand and how much was improvised. Some of these little details are present in live performances, but I’m not sure if they were part of a written arrangement or just added because they turned out so well on the record. Either way, it’s great stuff!